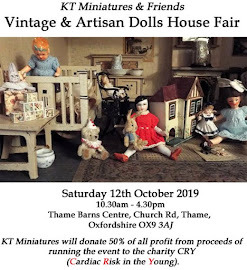 KT Miniatures rarely attends fairs these days ......but one that I would never miss for the world is this delightful bi-annual charity event............I just love it! KT Miniatures will be having a stand at this rather special charity bi-annual event run by two people who I have had the priviledge to know now for some years - Freda & George Dorell. They have run this event for as long as I can remember and it is still an understated little gem of an event....not to be missed! 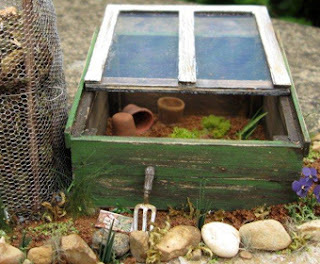 There will be various artisans such as Tony Knott, Coombe Crafts, Sallys Little People and of course....KT Miniatures! Also there will be various exhibits from local dolls house clubs and other individuals, sales tables from various people selling private collections and even a model Lego railway on display. I will bring more news about this event nearer the time. So.... do come and see us all in this tiny quaint corner of Buckinghamshire in November...if you can. You will love it! A week or so ago, I showed you an image of a rusty old dustbin that I had made with Robin Britton my Nostalgia In Miniature Workshops partner. 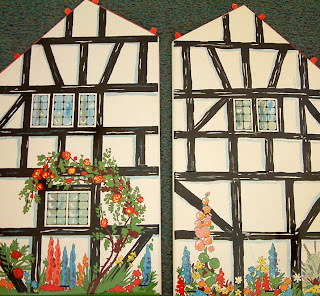 She had constructed it out of a cat food box and I had the job of painting it up in enamels....which is all part of a big magazine feature that we are in the middle of working on. Well.....this project has progressed a little further!!!! 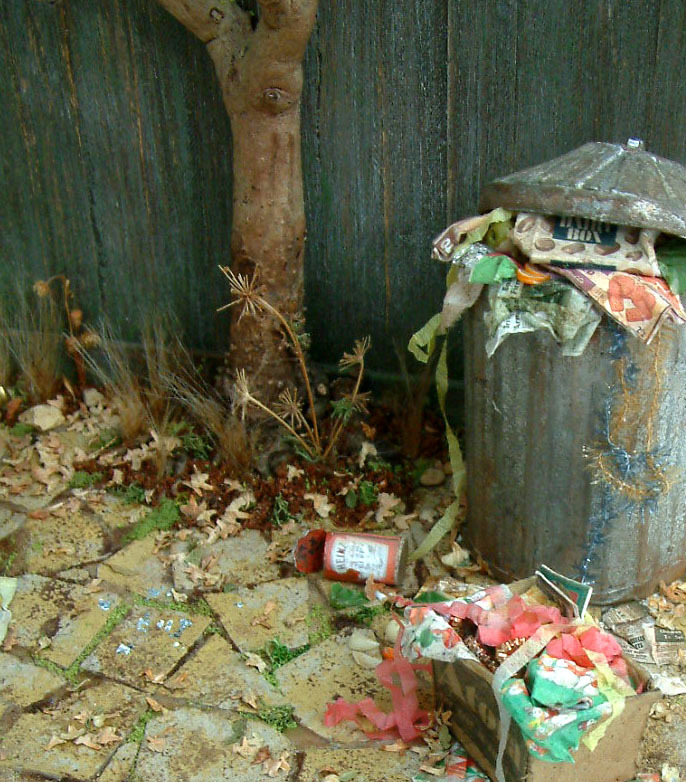 As you can see, the dustbin is now filled with rubbish from the 1950s.......surrounded by more rubbish, some of a quite festive flavour. No, your eyes are not deceiving you......you can see an opened 1950s can of Heinz Tomato Soup made out of card....great fun! Well.....the project is still not quite finished yet but from the image above you can gain a hint of what the project is all about!!! Hope to bring you more images as this project progresses plus some exciting news about it in a few days time....so watch this space!!! 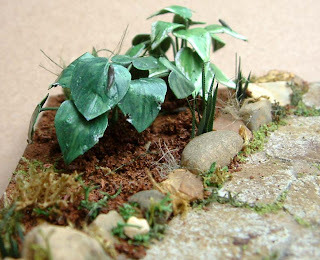 DOWN THE LITTLE GARDEN PATH WORKSHOP - Last Sunday! Just to say a huge THANK YOU to all the ladies who attended our workshop last Sunday. It was a lovely, lovely day and a very relaxing one too. 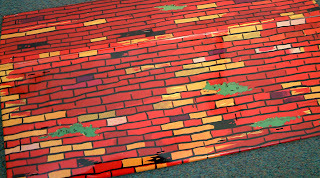 I think a good time was had by all and much creativity went on in the three hours that we had together!!! The atmosphere was terrific. Congratulations to Linda and Kazumi who were our two raffle prize winners this time! I am pleased to announce that our raffle and refreshments last Sunday raised a grand total of £35.34. All monies raised are in aid of Breast Cancer Campaign and at the end of the year a single cheque of all money raised through our workshops will be presented to the charity. Huge THANK YOU to everyone who contributed! So far, since our workshops began in June, we have raised over £70.00....so lets hope we can far exceed this amount by the end of the year! 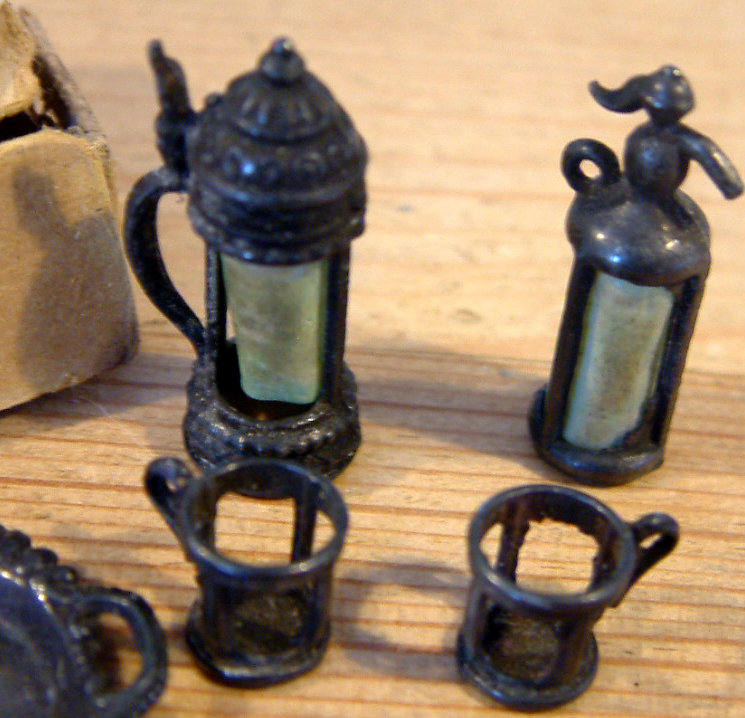 I have just listed two antique tin objects, both very different from each other and neither were originally intended for the dolls house! I have handled two of these German tin pencil sharpener globes previously over the years but this latest one, compared to the other two, is in amazing condition. 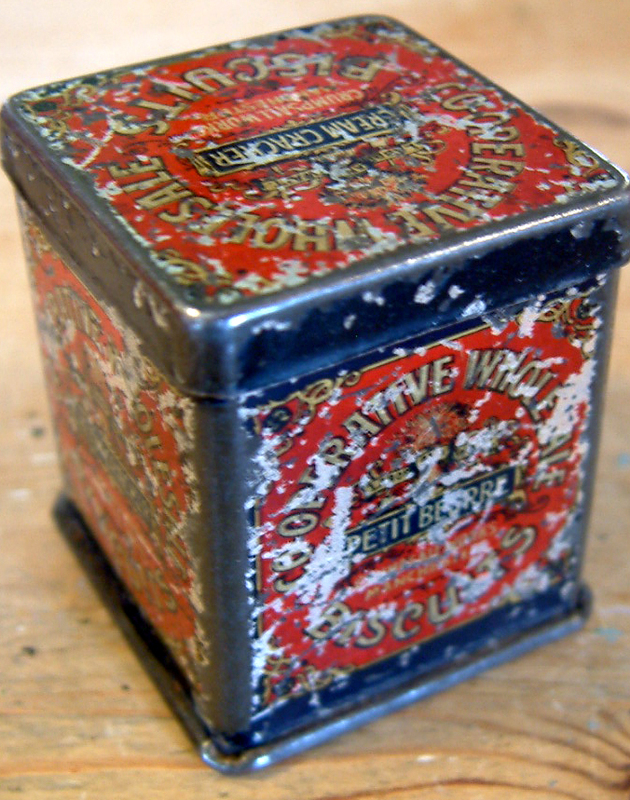 The patina of the colours are simply wonderful and it is a very tactile object....I love it! As an illustration on how the world map has changed since this was created, you can see the country of Persia....which I understand changed to Iran in the mid 1930s? 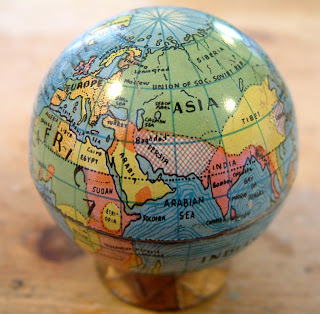 There is a hole at the bottom of the globe where the pencil would have been inserted. 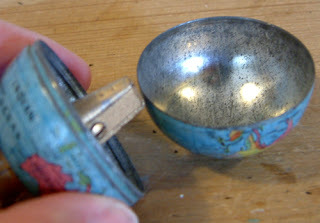 The globe unscrews at the equator and you can see the internal part of the pencil sharpener. This would look fantastic sitting in an old dolls house living room or drawing room, maybe on a small table or cupboard top? 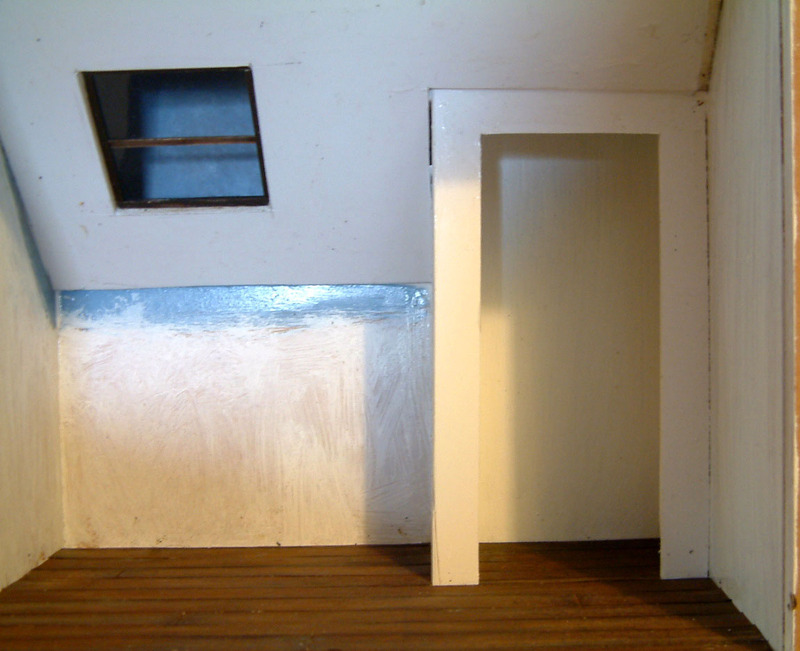 It measures 2" in height so would be suitable for a 1/12th or larger scale dolls house or maybe a smaller vintage dolls house where scale does not matter. The second unusual antique tin item is a Co-operative Wholesale Biscuit Sample Tin....amazing, very old and quite rare! I am well aware that this will not be everyone's "cup of tea" paticularly as the paintwork is considerably worn. 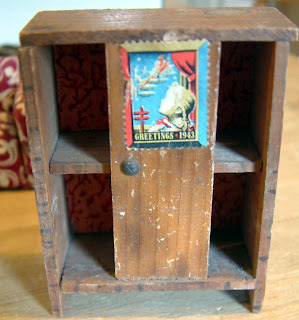 However, even though this is a bit on the large side, standing at 1 3/4" high, it would look splendid in a vintage dolls house kitchen or pantry.....or even a vintage shop. The exact age is unknown but has to be from at least the 1920s-30s...possibly older. 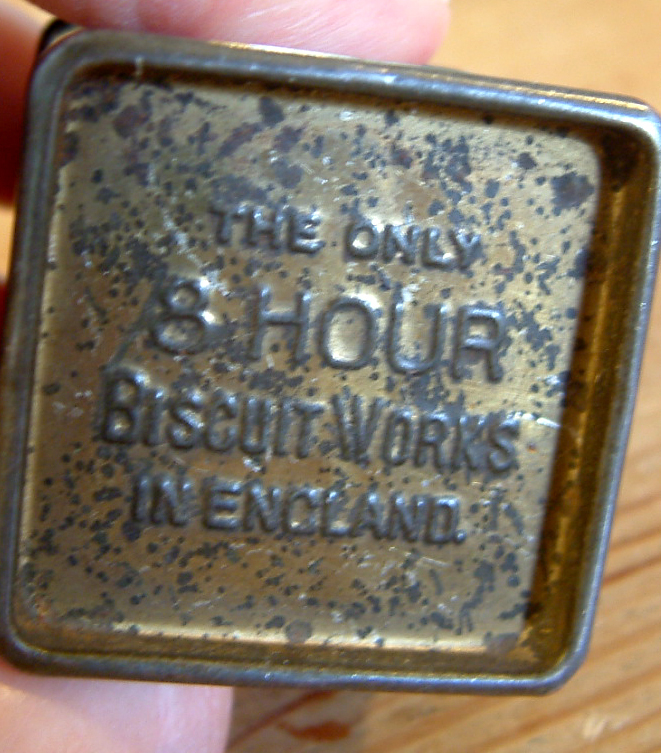 What I particularly love about this tin is this embossed statement underneath which says "THE ONLY 8 HOUR BISCUIT WORKS IN ENGLAND". This gives it a real sense of history. I did a bit of sleuthing to see if I could find out more on what this statement meant and was pleasantly surprised to find out that the employer was quite a pioneer in the way it looked after it's employees. Apparently, the Crumpsall Biscuit Works opened in 1873 at Lower Crumpsall, Manchester (UK). Employees were given a brilliant working environment which actually included sports facilities such as a football and cricket club, tennis courts, a recreation ground plus a bowling green. I understand that there was a dining room with discounted food and the facility of free warming for packed dinners. They were even provided a library and board /card games. 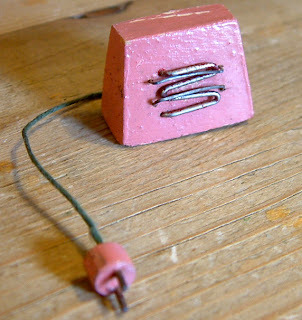 How fantastic and pioneering was that! Just A Few Days To Go 'Til Our Next Workshop - Still One More Space! You can reserve a place in the first instance whilst booking form/payment is being sorted. Our workshops are friendly and informal * You will be assured of a very warm welcome * You have an opportunity to meet like minded people * Learn new miniature techniques * Suitable for beginners and experienced alike * Work at your own pace! For full details of price/downloadable booking form etc. please see the DOWN THE LITTLE GARDEN PATH WORKSHOP page on our official workshop website. This week I have been at my workbench, beavering away at three different creative projects at the same time........below I can show you a hint of each! 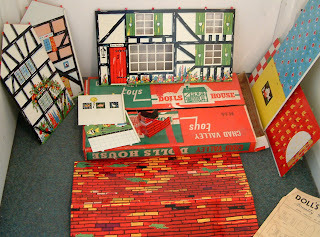 Robin Britton, my Nostalgia In Miniature Workshops partner and I have been asked to write a "show how to make" project for a UK dolls house magazine. 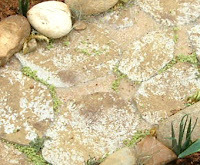 It is still in the very early stages but lets just say that it will be in the same style that our vintage garden workshop projects are based on ie. 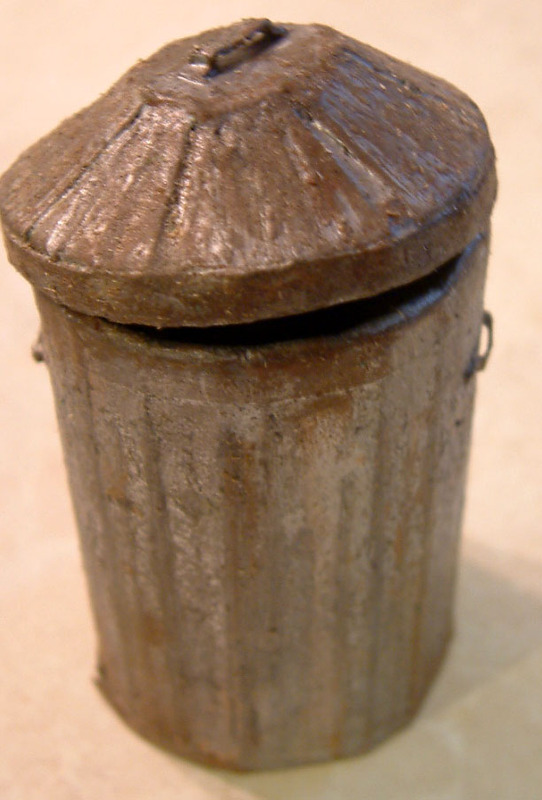 vintage, weathered and realistic! 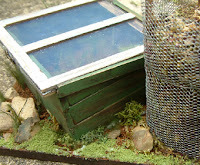 We finally made a start this week.....above you can see a dustbin that Robin made brilliantly out of cat food cardboard packaging- she said it took her a while to suss out how to make the lid......but I think you will agree she got the shape perfectly. 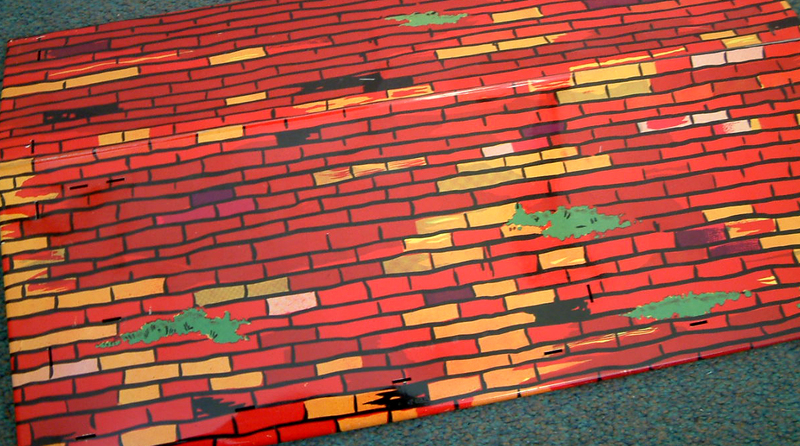 She then handed it over to me for the fun bit.....to paint it! The rusty old metal effect was obtained from enamel paints and we were both chuffed to bits with the result. Over the next few weeks we will bring you an update on that particular magazine project but hope the above was enough to tempt your tastebuds and inspire! 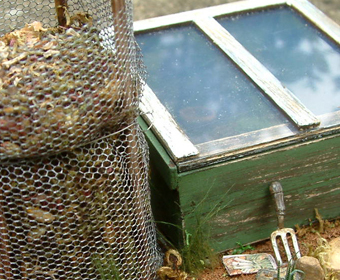 Meanwhile.......I went into mass production of cold frames in readiness for our next workshop that is taking place on Sunday, September 18th - Down The Little Garden Path. 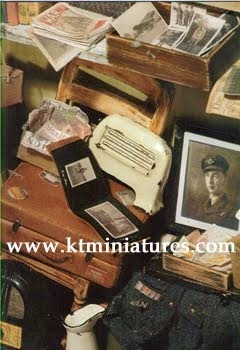 This project is being offered in 1/12th as well as 1/24th scale. I have made up the basic frames, based on a 1930s design from an old book, in readiness for attendees of the workshop to learn how to age them. By the way.....we still have a couple of spaces left for this workshop. So do get in touch with either Robin or I if you would still like to come!!! Finally, today I have had to pull my finger out on a more personal project that I have left until the last minute (as is often the case)!!! 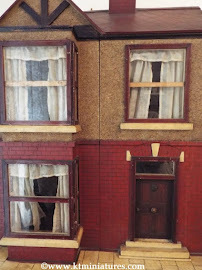 It is needed for next Monday evening's dolls house club meeting (here in Thame) of which I am a member, needless to say it ended up at the bottom of my "to do" list as KT Miniatures work had to take precedent. But, after an afternoon at my workbench, am pretty pleased with the result and it is beginning to take shape rather nicely. The club's annual project is to construct an attic scene in a MDF room box, supplied as a kit by The Dolls House Builder. 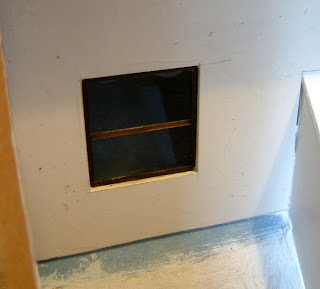 The window shape was cut into the sloping foamboard (the back wall having first been painted in a mixture of pale blue and white to replicate sky). 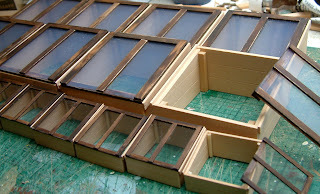 A window was made from sliced up strips of cardboard painted brown and lightly sanded, then a square of thick acetate cut from packaging ( a double shirt pack from Next) and all glued into place. Convincing floorboards have been made from cardboard, painted with burnt umber acrylic layers and shaded with a touch of white, sanded well then sliced up and fixed into place. 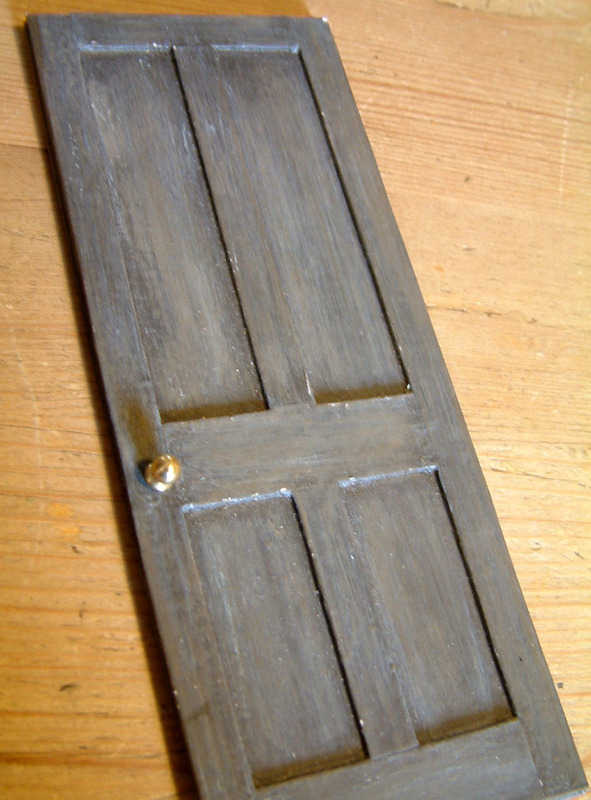 The mock door has literally been created from just two layers of cardboard sandwiched together, strips of cardboard glued on the one side, painted with several layers of raw umber paint then sanded well. A commercial brass handle has been added. 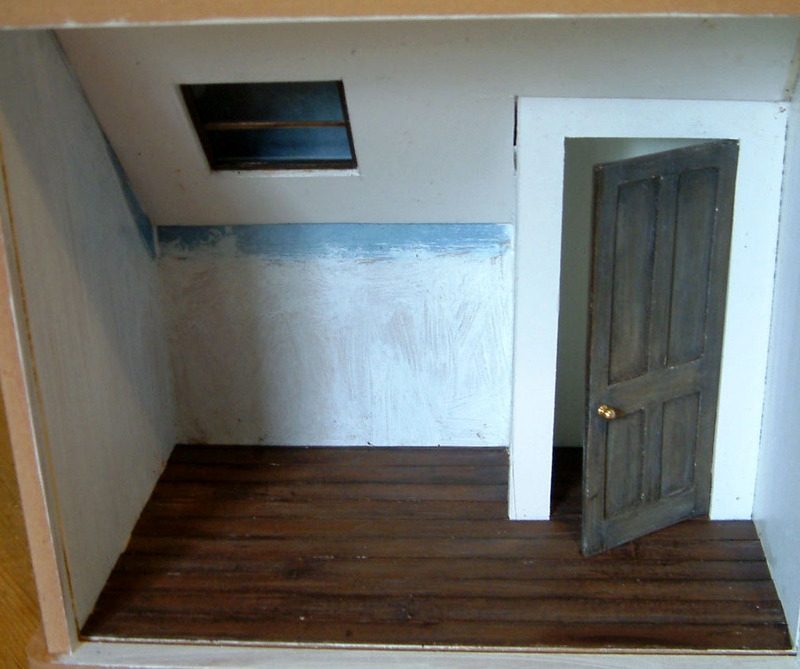 The alcove in foamboard on the right of the scene has been added to give extra interest and the door will be fixed ajar tantalisingly giving a glimpse of a landing! Well...that is as far as I have got. 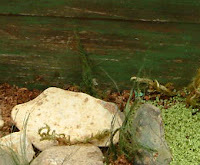 As this little personal project progresses, I will show you more on here. 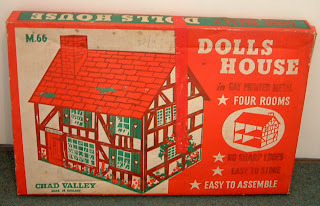 c1950s/60s Chad Valley "Rose Cottage"
I am a great fan of vintage tin dolls houses. 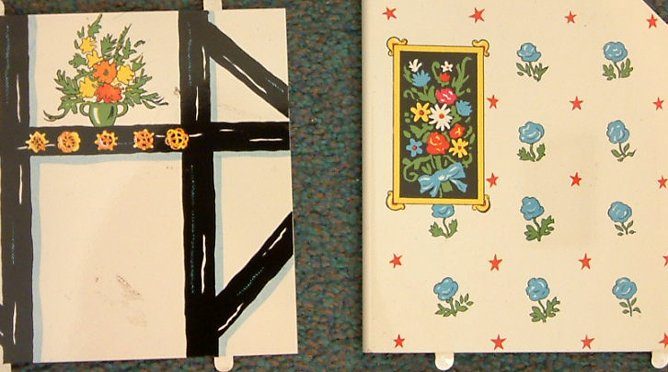 The sheer vibrancy of the colours and the lithograped designs on several of the various tin houses that were available, are magnificent. 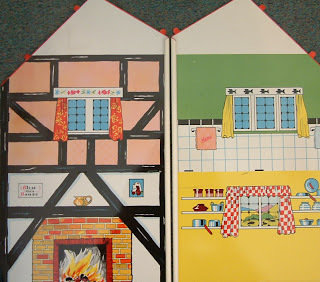 Some furnishings and often furniture are often incorporated into the lithographed images on walls of these tin houses. Such is the case with this stunning 1950s/60s Chad Valley "Rose Cottage" - absolutely gorgeous! What is wonderful about this open backed four roomed house is that it is complete and ready to assemble yourself in it's original box -all in fantastic condition. I cannot say that it has never been erected, because one look at the tabs that slot into allocated holes for construction, you can see they have been used. 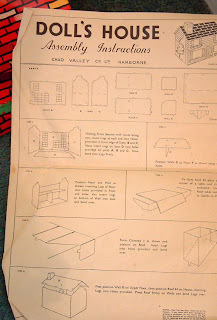 Plus the roof and chimney have obviously been erected at one time, then flattened again so as to fit into the box. 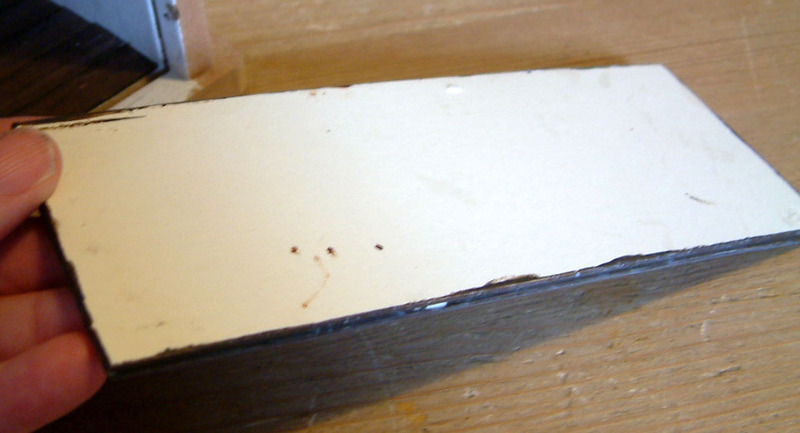 The sheet with full assembly instructions is present, as you can see. All nine pieces are present and correct - fully intact. 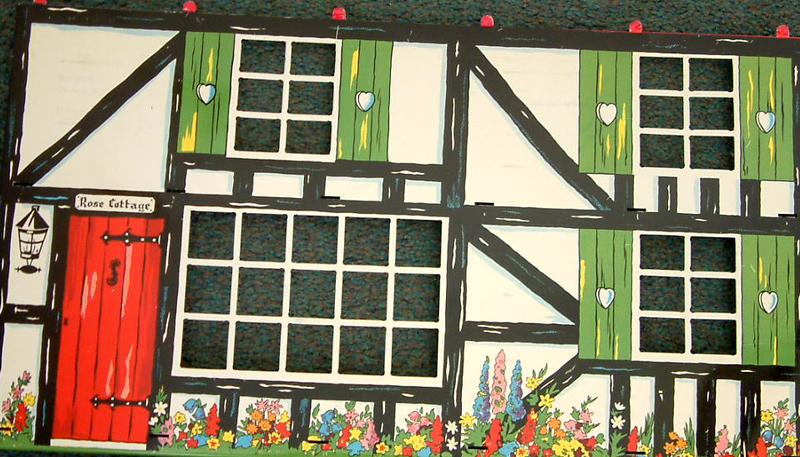 The front is extremely attractive- lithographed details of an old cottage complete with timbering and shutters. 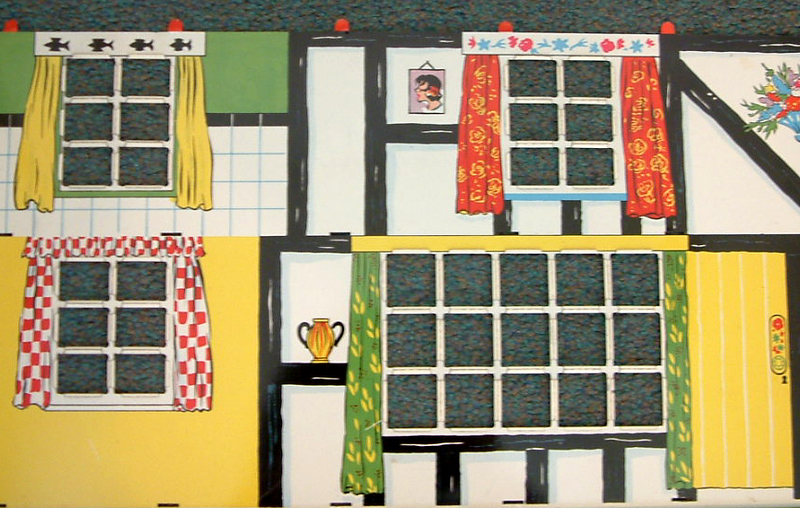 On the other side of this front piece you will find the inside decor of four rooms. As you can see, the colouring is so pretty - I particuarly love the cottage flower bed images that is found all the way around the outside of the house. Not a weed in sight! 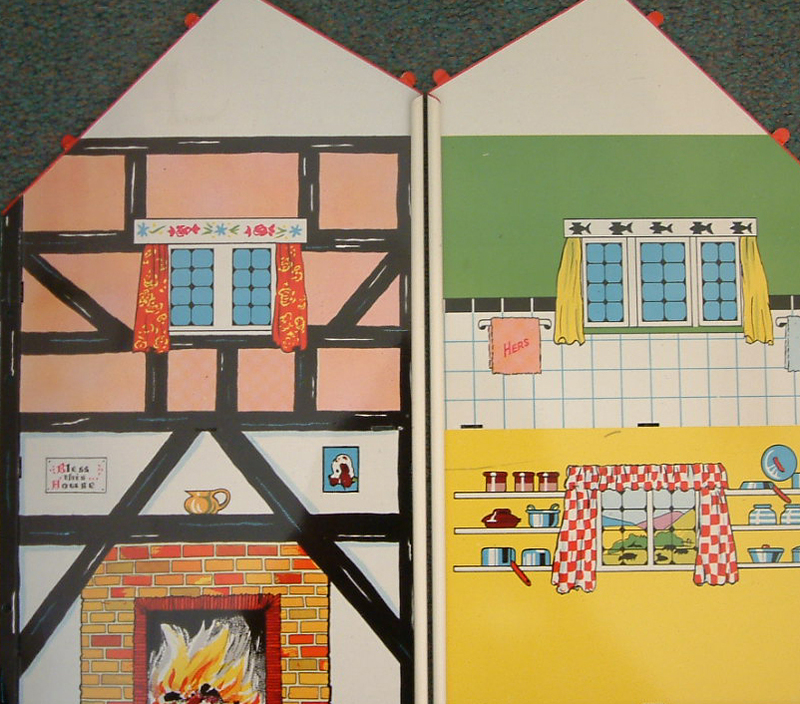 On the inside of these side pieces too, are images of the interior. There are two interior dividing walls plus two floors that insert into place. 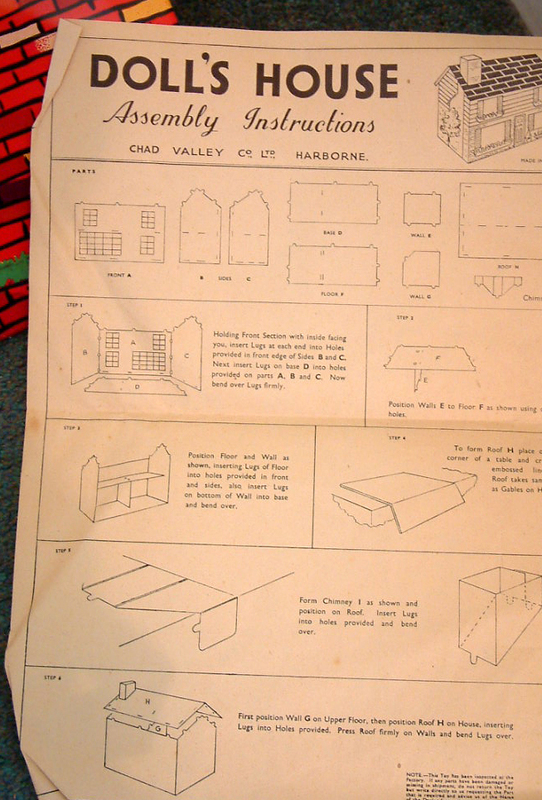 Finally there is a "tiled" roof and "brick" chimney which you need to bend into shape, as per the instructions. 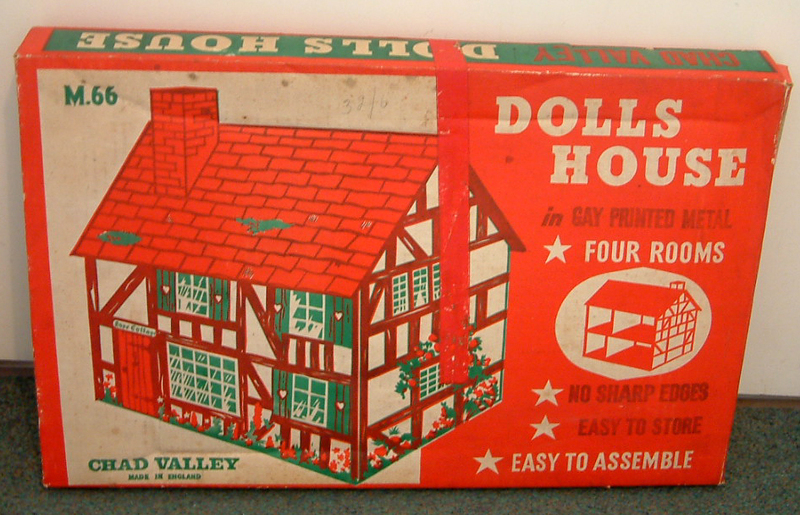 It is so refreshing to have a tin dolls house of this age that shows no rust or damage. In fact, apart from just one or two teeny scratches, this is indeed immaculate. 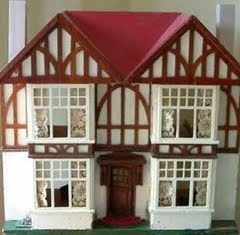 Quite a few antique and vintage dolls house items have been put up for sale today on KT Miniatures website. Amongst them are some unusual pieces which I have chosen to highlight on here. Above you can see a very old "Silversmith's Novelty Set" complete with contents and the original box that's just about being kept together with some ancient tape. 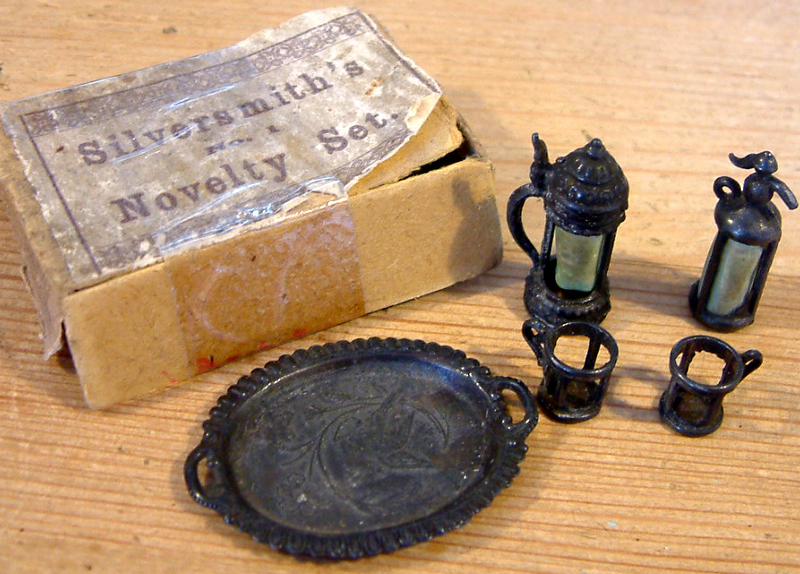 The contents are most definitely not silver but appear to be pewter and consist of a soda syphon, tankard, two mugs and a tray. Exact maker is unknown but probably German and considerably old, dating from at least pre-war 1930s...possibly older. The tankard and syphon have pale green celluloid tubes to replicate glass. I suspect the mugs would have had the same celluloid tubing but sadly are long gone. The tray is delightful and has an embossed bird design which hopefully you can just about make out from this photo. 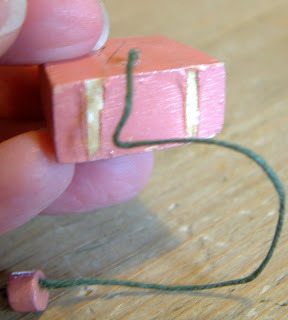 This next little item is a charming wooden electric heater. 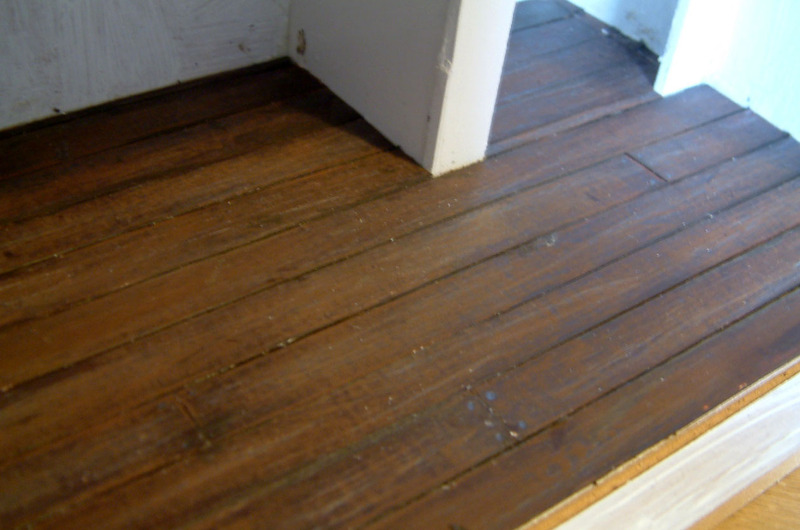 Although simple in construction, there is no doubt that it has been commercially made. It has a price of 1/9 written in pencil on the back. The two pin plug is an interesting feature and I guess that this was made in the 1940s/50s era. I have handled dozens of various little heaters in my time but I have to admit that I've not come across one quite like this before...is different again. Obviously at one time there would have been two little struts fixed to the underside, as you can see from the residue left behind but sadly these are no longer there. 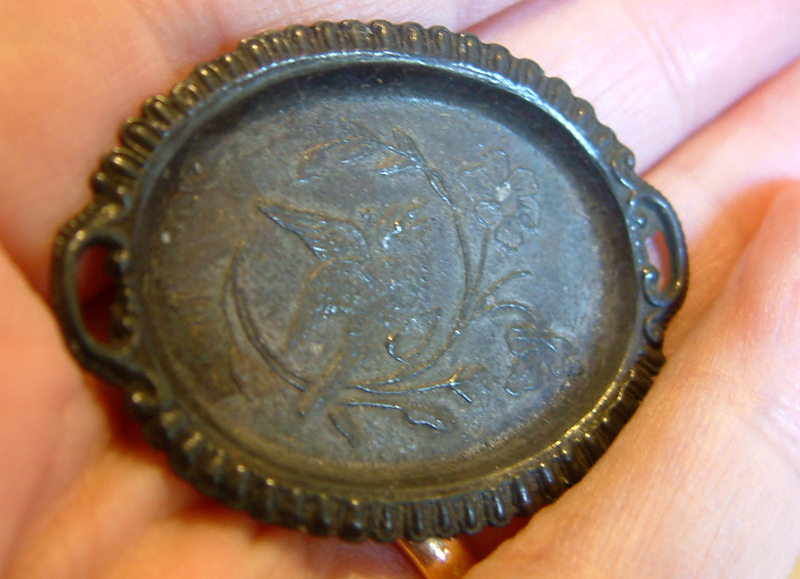 Nevertheless this does not detract from the overall charm of this little item. Finally, I must just show you this sweet little cupboard from the 1930s, probably German and somewhat a little worse for wear but I love it! What really adds to the character is the little "Greetings 1943" sticker that a previous little owner has stuck on the front!!! I can't help wondering who this once belonged to and what kind of childhood they were having in 1943 - if only these old little treasures could talk....what stories they could tell!